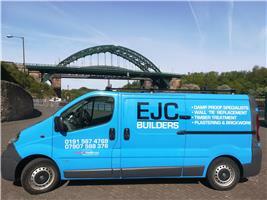 EJC Builders - Damp Proofer based in Sunderland, Tyne and Wear. Ejc builders and dampproofing specialists have been delivering a fast and high quality service throughout the northeast for some years now. With over 26 years within the construction and dampproofing industry , work ranging from dampproofing, timber treatments ,and wall-tie replacement . With only time served tradesman we offer you a fast and effective service to eradicate your damp issues . Also we offer you the costomer a 30 year guarantee on all dampproofing , 25 year guarantee on all wall-tie replacement and timber treatments to give you tne costumer peace of mind on work carried out on your property. Call today for your free no obligation quote and let us do the rest .